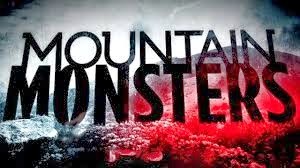 Mountain Monsters - Bigfoot On Tape? Here is a preview of the upcoming episode of Mountain Monsters. The creature depicted in the show is called the Grafton Monster, which could be another name for a Bigfoot. The "monster" is described as being between seven and nine feet tall with white or light gray skin. The legend hails from the Grafton, West Virginia area. Show airs on Destination America at 10/9C. Why would you waste your time promoting such an idiotic show with wanna-be hillbillys running around the woods with shot guns? It's certainly not big foot research. Like Fraud Standing is any better with his collection of ewok masks. The Grafton Monster is legit and unlike those frauds like Bobo and his tool friends, these true trackers and hunters have what it takes to find this elusive creature. Maybe these other so called "bigfoot hunters" should take a lesson from these courageous men!